I’d been wanting a sound system for the Defined Benefit. We’d been using a battery-powered portable speaker system, but I really wanted something that was set up and ready to go at all times. The problem was that I didn’t want to mount one in the console (cutting a hole), nor cut holes for speakers, and pulling wires on a boat can be a real chore. So, what to do? I was browsing Overton’s and the solution jumped out at me! They had a Dual MCP420GH Bluetooth Receiver with a universal gimbal mount for a very attractive price. It came with a pair of 6.5″ speakers, but I didn’t want to use those (remember, I’d have to cut holes in something), so I just put them back for possible future use. I got a pair of waterproof Poly-Planar MA840 Sub-Compact 3″ box speakers, because what I planned to do was suspend them from the T-top. The receiver itself I mounted in the electronics box of the T-top, next to the VHF radio. I had plenty of open connectors and fuseblock slots there. The gimbal mount had a plastic front cover, which I removed, as the electronics box is already weatherproof. I drilled two small holes in the electronics box, one on each side, through which I ran the speaker wire, and sealed with marine caulking. The speakers themselves I suspended from rails on the T-top, holding them in place with heavy duty cable ties. This means that if at some time I want to reposition the speakers, or buy a nicer set of speakers with more sound, I can easily do so…or add a second pair, and reposition these facing a different direction. The results are great! The receiver works well for Bluetooth pairing with my iThings 😉 for both streaming audio and hands-free calling (not that hands-free calling is something I honestly think will be very useful on a boat!) FM radio reception is good, with the flexible wire antennae coiled up behind the radio (it’s good enough to get eastern NC classic rock station WSFL which is all I want, other than Bluetooth from the iThings!). The speakers are decent. The reviews were that they worked well, but just didn’t have a lot of punch…but what do you expect for a pair of $55 speakers? The whole package was under $200, and I’m a happy camper. This entry was posted in Boating on June 8, 2014 by joel. I’ve been wanting a new boat, one that was a bit bigger to make it easier to expand fishing opportunities (such as running over to Cape Lookout), as well as carry more people and more dogs 😉 . We’d actually planned to buy it next spring, but Jan found a 2013 closeout model like I wanted, with a good price. That’ll teach her to Internet shop! Anyway, the bottom line is that I got a Carolina Skiff “Ultra Elite” 21, with a 150 Suzuki. Took her out today for her maiden voyage. Ran very well, especially on a very windy, choppy day on Bogue Sound. Nice dry ride. The hull is a semi-vee that flattens out at the stern for a relatively shallow draft of about 10″ (excluding lower unit) so it should be good for running around the shoals in the sound. We toasted the first voyage with a glass of prosecco at the Point. So, what to name this boat? We called the previous boat (a Carolina Skiff 1765 DLX) Sandbar Hopper, and we’ll have fond memories of the last five years with her. This new boat is more or less my retirement present, as I’m stepping down at the end of December, so I’ve decided to call this one Defined Benefit as without a pension, there wouldn’t be a boat 😉 . The next step is to figure out the font, color and size of the lettering and order it from Overton’s! 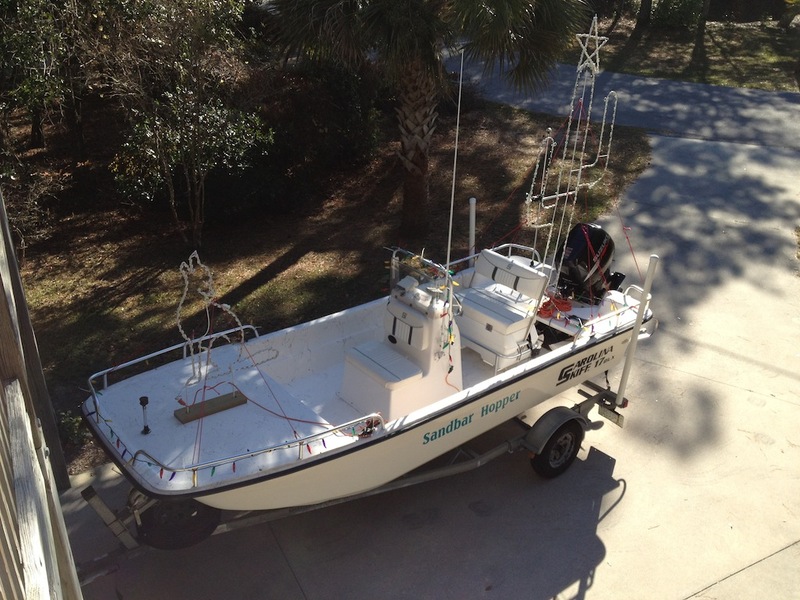 I’ve got to install the VHF radio, but will have to wait for Santa to bring me a chartplotter. Enough for now…tomorrow, I’ll sort out some fishing rods and load up. See you on the water! 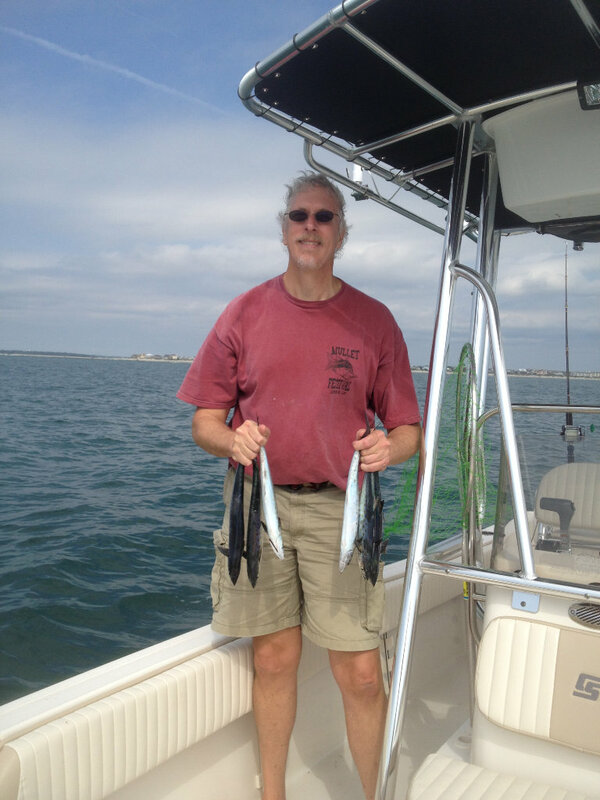 This entry was posted in Boating on September 27, 2013 by joel. While Thanksgiving day was blustery, the weekend was warm and sunny, with light winds for both “Black Friday” and Saturday. The Dunns decided to head to the coast for the weekend on Thursday night. The plan was to have a family lunch at my sister Susan’s house in Swansboro on Saturday, and then head back to Chapel Hill so we could take Jeff to UNC-A. 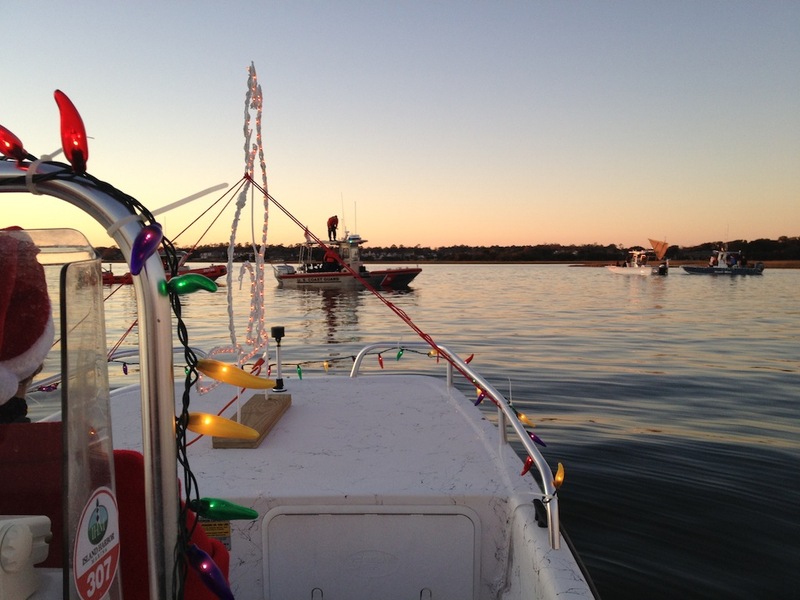 An added attraction was that Friday evening was the Swansboro Christmas Flotilla. 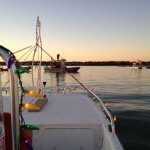 We made plans to decorate the Sandbar Hopper to participate in the parade. We brought two holiday yard decorations, a cactus and a coyote, that have been used over the years to highlight the annual Chili Party. 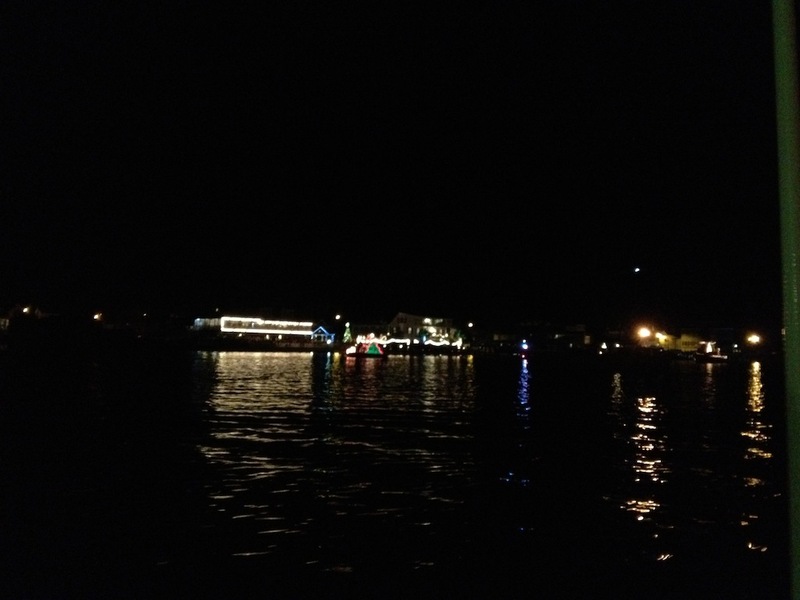 I mounted them on the boat, added some chili pepper lights that Susan had bought, hooked it all up to an inverter, and we were ready to go! We assembled at the EI bridge at 4:30. This was a small flotilla, as I found out at the Captain’s Breakfast on Friday…only about 15 boats, and the Chamber of Commerce was enthusiastic for any and all participants. 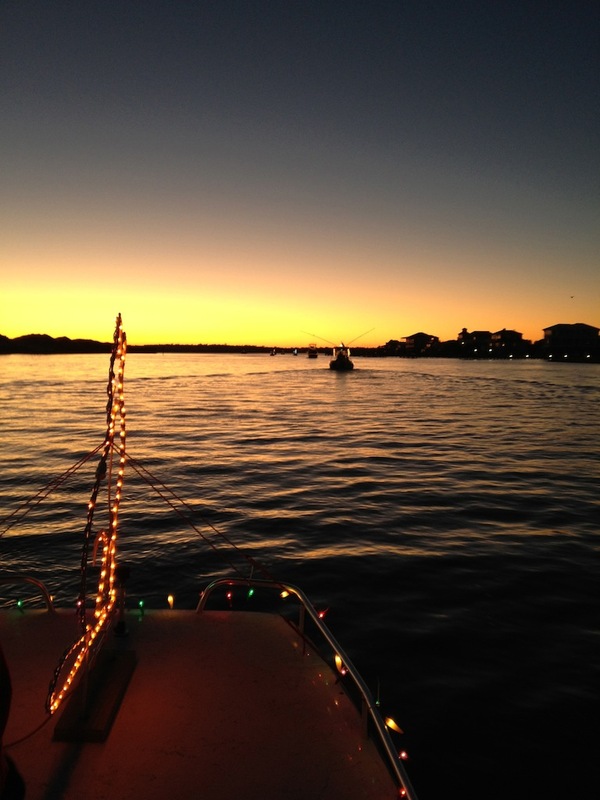 We followed the Coast Guard as they headed west on the ICW towards Swansboro, as dusk came on. We soon realized that we’d taken the “newbie” position, next to the “swan” which had a massive array of lights on a swan frame, charged by a generator, and a sound system blasting Elvis and “Blue Christmas.” Next year, we’ll lag behind a few positions 😉 . It was really a great time. There were many people on the docks as we passed through Cedar Point, and huge numbers on the bridges, docks and shore in downtown Swansboro. 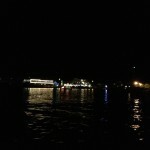 We made three turns through the darkened harbor before heading back to Island Harbor. What great fun…until we got back to the marina and my Yukon wouldn’t start 🙁 . We used Susan’s RAV to pull the boat out and back to the house. The Yukon visited the Swansboro Chevy dealer via a tow truck. We pick it up tomorrow, the diagnosis being a failure of the “neutral safety switch.” Oh well! 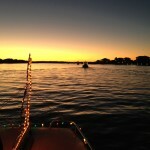 This entry was posted in Boating, Family on November 28, 2011 by joel. Saturday and Sunday this Labor Day weekend were about as nice as you get for early September weather on the NC coast. Mild (mid-80’s), low humidity, light northerly breeze, and the ocean was about as smooth as a lake. On Saturday, we beached “Sandbar Hopper” on the east end of Bear Island (Hammocks Beach State Park) and walked around to thhe ocean side. Lots of sand moved during Irene, but not sure where it went. All the State Park “no alcohol” signs were washed away, too 😉 . The west end of Bogue Banks didn’t show evidence of appreciable buildup of sand (or signs!). Generally, there was very little storm damage here. The docks at Island Harbor Marina took a lot of damage, and other private sound-side docks were worse for the storm. The dunes on Emerald Isle had very little damage, but the beach is very steep right now. The steepness helped to deflect the energy of the water into the surf zone rather than the dunes, I think. A few years ago, Emerald Isle pumped lots of sand on the beach, and while it’s coarse sand and not as nice as the sand at Bear Island, it served its purpose in the storm. We went back to Bear Island on Sunday. The tide was half-high and rising when we got there, So we easily ran the Bear Inlet access channel, and worked our way up along the back of the island very close to the inlet. We were the first boat in there, but as the day progressed, about 15 others showed up. Walked along the beach on the ocean side, and the dunes had taken a beating. The beach was very flat (still is) and the waves crashed into the dunes during the storm. The high tide line is now at the base of the dunes. It’s natural movement of sand, but clearly the sea took some island back. I expect we lost a lot of turtle eggs, as those nests that hadn’t hatched were flooded (there were 34 nests on the 3 miles of Bear Island this year). 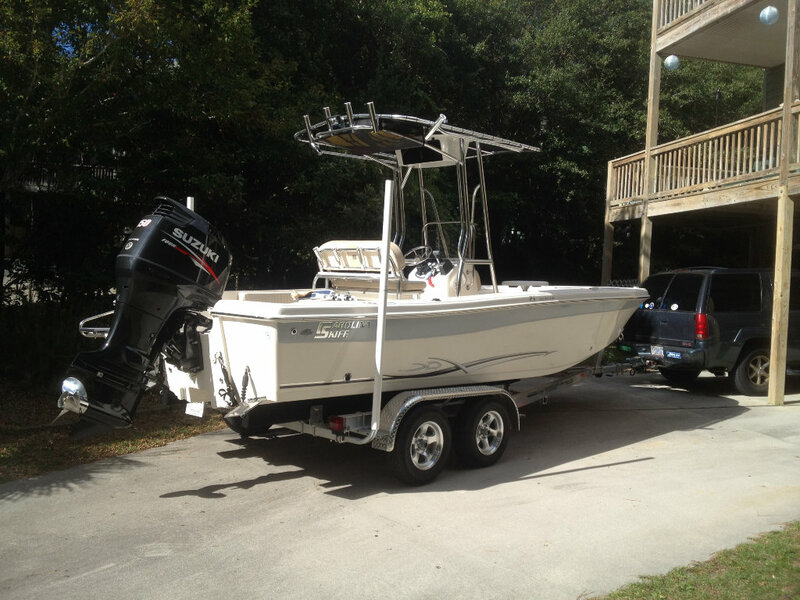 When we left, we took Sandbar Hopper out Bear Inlet into the ocean, and ran east to Bogue Inlet. The damage to the dunes was clearly visible where we were, about 1/4 mile offshore. The ocean was smooth, with widely spaced small swells as we skimmed over the water. The bouys marking Bogue Inlet are still out of place from the storm, but on a day like Sunday, you really don’t need them, just watch the water and the breakers. As we cruised into Bogue Inlet, we looked at the crowd on Coast Guard Island (a spit at the end of Bogue Banks) and were glad we’d gone to Bear Inlet. Must have been a couple hundred boats, with huge crowds swimming, sunning, and enjoying the holiday weekend. We scooted over to the Coast Guard channel, then around to the back channel, under the bridge and back to the marina. Grilled tuna and portabello mushroom caps for dinner; a great weekend. This entry was posted in Boating on September 5, 2011 by joel. This entry was posted in Boating on July 3, 2010 by joel. We got to Weldon about 9:30, and the parking lot was about as full of boats as it could be…I pulled the boat off the trailer while Sam parked my truck. The extra (third) lane on the ramp helps a lot with traffic! We ran down the river to Big Rock, and set up the the drifting flotilla of bait fishermen. Talked to a couple of fly guys who’d picked up a couple of fish, but it was slow for them. Water temp was about 63.5F. Drifted for a couple of hours, and couldn’t buy a strike. We were marking fish about about 6′-8′ deep, per the fish finder, but no luck for us. We were watching the bait guys catching fish slowly but steadily. Picked up and ran down to the power lines, but didn’t change our luck. Decided that we wanted to anchor and eat lunch, so we ran back up the river and anchored in front of Troublefield Gut. Had lunch and watched the parade of boats drifting by. We caught a couple of fish, including a largemouth, a crappie and a couple of stripers. We decided to head to to Big Rock (bigger than last week, as the river was down to about 8,000 cfs), but talked to a couple of fly guys who’d found a seam and caught about 20 about 1/2 way up Little River. They suggested we try that, and did, but wasn’t working for us. However, Sam had the “catch of the day” when he foul-hooked a turtle in the foot! We tried all sorts of colors of flies, but chartreuse/white worked “better” (that’s a relative term!) than others and tried both sinktip and full sink lines. It was one of those days when the fishing was better than the catching. Headed home about 4PM. Maybe my fish mojo will be on next time, but still a great day to be out. 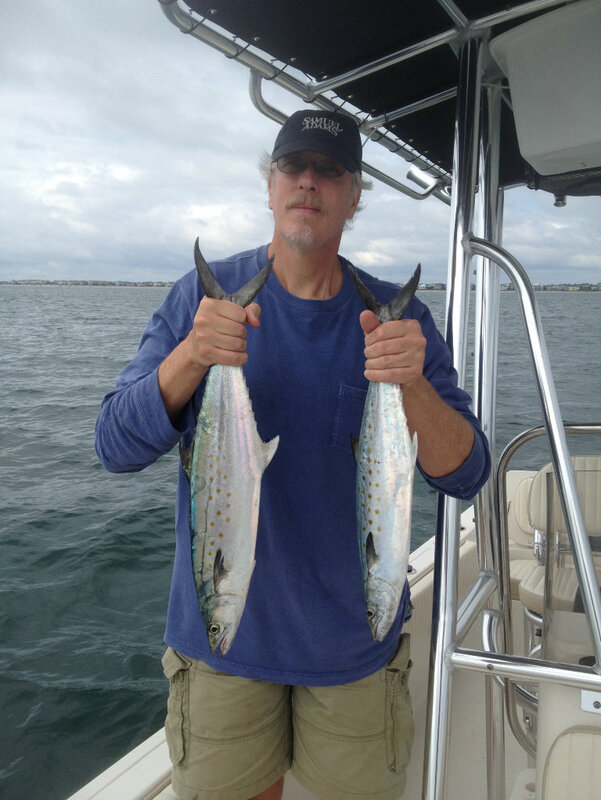 This entry was posted in Boating, Flyfishing on April 24, 2010 by joel. On March 19th, Sam and I made our annual pilgrimage to Weldon to hook up with some Hickory Shad. I’d like to do more than one trip, but I’m happy just to be able to go! We knew that it might be a bit early in the season, with the high water recently and cool temperatures. However, with a day scheduled off work, and the forecast for a beautiful day, we headed to the river. When we got there about 9:45AM, the river was running ~9000cfs, and very stained. We launched the boat and were quickly on the river. We ran downstream past the water treatment plant and were thinking about going to Troublefield Gut (~2.8 miles downstream on river left, per the NC Wildlife map), but a boat was already there. We ran downstream further, stopping and trying a few places. Not even a bump. River temperatire was 47F per my boat’s sensor. Went all the way down to Halifax (about 10 miles) to see if the water was any warmer or if any fish were there. Nada. Tried the long rods and spinners, no luck. Turned around, and went back upstream. About 12:45PM, we got back to Troublefield Gut and no one was there, so we anchored. I had a couple of bumps and soon caught a white perch. Then, Sam caught a small striper. We were both fishing full sink lines at the time, and were down on the bottom. We then started picking up shad. Not a banner day, but 15-20 fish between the two of us from 1PM to 3:30PM. We switched to sink tips from the full sink lines as the fishfinder seemed to indicate that there were fish 5-6 feet down. Seemed to work, as we both caught more on the sink tips. Interestingly, the water temp warmed to 50F by the time we left, and that might have helped. As we left, we saw about a half dozen boats near the water treatment plant. Talked to one group, and they said that they’d caught some, but like us it was sporadic. We caught all our fish on pink flies (though I’ll make ’em a bit differently sometimes), and didn’t catch anything on the spinners until we changed to pink jigs. So, for us, pink was the color of choice. This entry was posted in Boating, Technology on March 20, 2010 by joel.